Written with contribution from Trekaroo Guroos and RV veterans Heather Erquiaga and Amanda Williams. The following post is sponsored by Sun RV Resorts. 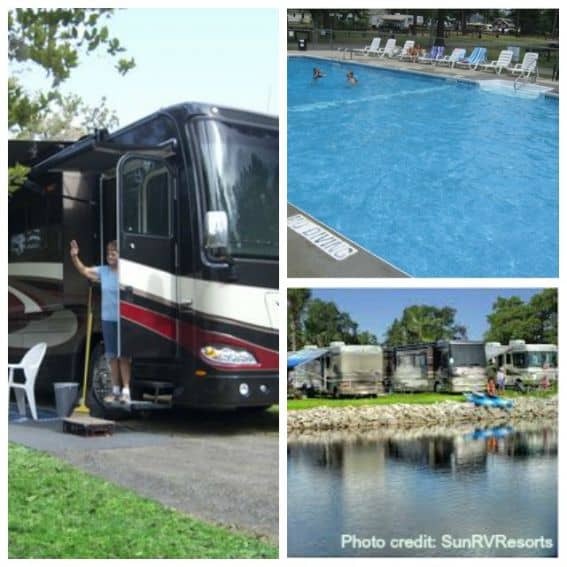 Sun RV Resorts offers a collection of fully-appointed RV vacation resorts with exciting destinations throughout the United States. The goal at Sun RV Resorts is to provide a fun and friendly environment with bountiful amenities and irresistible local attractions. A variety of amenities are included, such as tennis courts, billiards, horseshoe pits, fitness centers, heated pools and hot tubs, shuffleboard courts, recreation halls, nature trails, pickleball, petanque, volleyball, bocce ball, planned activities, sport leagues, live entertainment, fishing, libraries, and much more! RV camping is a great way to combine a road trip with a relaxing outdoor family vacation. With the benefit of electricity and water (not to mention a roof over their heads), parents can keep kids a bit cleaner, the weather is less of an issue than with tent camping, and families have a ‘home base’ during vacation for less than the cost of a standard hotel room. But if you’re new to the experience, RV camping can feel overwhelming. 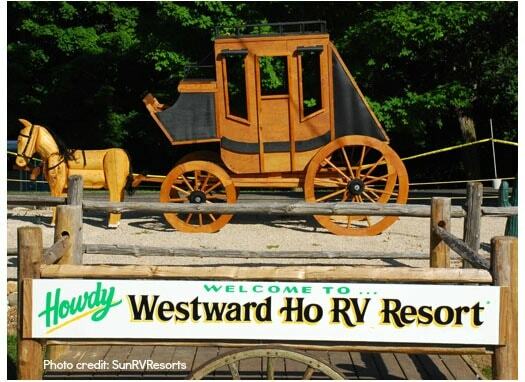 Read on for RV camping tips from veteran Trekaroo families. RVs are a big expense, but what must also be figured in is the gas. These days, fueling your RV will be a significant part of your vacation budget. Whether you rent or buy an RV, you’ll need to take the cost of gas into consideration. Before buying, take at least one trip in an RV–either in a friends’ or relative’s–for at least a week to see if you like it. Bring the kids, and make sure all the adults take a turn driving! After the test run, consider how many times you’d use the RV each year. If it does not outweigh the cost of renting, you might re-think the purchase. If you want to rent only, you have several options, but all of them will include a hefty rental tax on top of the daily or weekly rental fee. Families will save money renting and returning the RV to the same location (as opposed to a one-way trip). For a first rental RV trip, consider going only a short distance to save gas money and daily rental fees. an outdoor rug to place under the awning for muddy shoes and gear. RV campers tends to use the campsite as a base to explore nearby areas. A great RV campground will not only have fun amenities on-site, such as pools, playgrounds, and putt-putt golf, but are close to lots of sights. If you plan to spend most of your vacation time exploring the area near an RV campground, you may find that you only need your campground as a place to sleep. On the flip-side, if you plan to stay multiple nights, amenities such as laundry rooms, WiFi, and TV hook-ups become cherished luxuries. Research potential campgrounds ahead of time to find out if they allow advanced reservations (most private campgrounds do, as well as some spaces in state parks and national parks), whether your site will be pull-through or back-up, and what hook-ups you can expect. Read more tips on what makes for a great campground. 1. Pack smart: Give each person in the family a cardboard box or tote that fits into the seat of the dining table. Allow each family member to fill his or her with clothes and personal items for the trip, then simply transfer the box to the RV to make packing easy and compact. 2. Choose campgrounds and RV parks with lakes or water features. Sure, families get the luxury of a shower in their RV or at least shower facilities at the campground, but a lot of the fun of any camping experience is centered around watersports and playing in the lake. 3. Park smart: Park your RV in the shade to avoid running the A/C all the time, and remember that while many public lands allow you to stay in one spot for only a nightly rate, private RV parks have rental spots available on a weekly and monthly basis as well. 4. Snag a deal: Many campgrounds are in need of campground hosts (especially state parks and national forests) and they will usually give you a free spot in the camping/RV area as well as a small daily stipend (usually not over $20/day) to stay there during the “busy” season! Worth looking into if you find a place you love! 5. Bring an extra car: Families will want to bring some kind of secondary transportation if possible , whether that’s a car hooked on behind, a vespa, or bicycles.